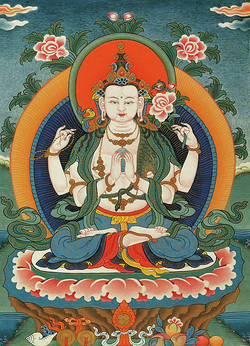 Avalokiteshvara, the Bodhisattva of compassion. I am an experienced and compassionate teacher, tailoring my guidance according to the needs of each practitioner. And while I always offer sincere encouragement, I believe that self-encouragement on your own part offers a deeper benefit and can enhance your Yoga experience. I listen to, guide, and support my students in awakening to themselves through the meditation of asana (postures), vinyasa krama (an organized sequence of postures), and pranayama (breathing techniques), with the intention to maintain and restore well being. I believe that Yoga is a spiritual practice, not perfection, and that each day, each moment, is a new journey. Within that journey, within itself is home. Home can be your Yoga, if you want. We can map a course of action or go to wherever your Yoga takes us, always remembering though to feel your Yoga, to observe and choose, to engage in svadhyaya (self-study) while refraining from analyzation and judgment, and to come back to center: you and your breath. Within that process, you could free and liberate yourself. Who wouldn’t want that?